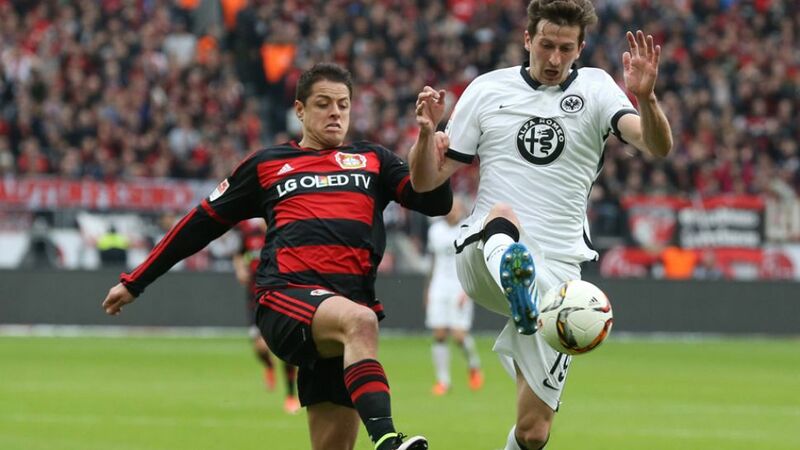 Bayer 04 Leverkusen face an anxious wait to find out the extent of an injury suffered by leading goalscorer Javier 'Chicharito' Hernandez in Saturday's 3-0 win over Eintracht Frankfurt. The Mexico international was attended to on the pitch by the Bayer physio after appearing to overstretch a knee 21 minutes from time, before heading straight down the tunnel for further treatment. Leverkusen went on to win the game thanks to goals from Hernandez's replacement Kevin Kampl, Julian Brandt and Karim Bellarabi, but will be desperate to have the 16-goal Mexican fit for the final four games of the season against FC Schalke 04, Hertha Berlin, Borussia Mönchengladbach and FC Ingolstadt 04. Die Werkself are third in the , albeit only two points clear of fourth-placed Hertha in the race for one of the Bundesliga's two remaining UEFA Champions League qualification spots.